And while their numbers have decreased in recent days, many maintain that they’re destined for the United States, undeterred by the Trump administration’s plans to send troops to the border and — so far — unenticed by Mexican officials’ attempts to convince them to stay. 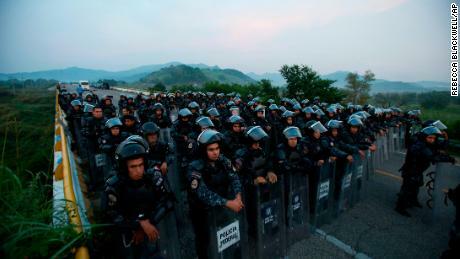 The tense situation has forced Mexican authorities to walk a political tightrope — trying to mollify the US government while also sticking to a strategy more in line with their own country’s policy goals. The stated aim: Treating migrants with dignity and respecting human rights, while also enforcing immigration laws. On a video posted on Twitter Friday, Mexican President Enrique Peña Nieto made his pitch. Under a plan dubbed “Estas en tu Casa” (You’re at Home), officials said migrants of working age could apply for asylum and would be eligible for certain jobs — provided they stay in Chiapas or Oaxaca, two southern Mexican states. The migrants are currently in Oaxaca, likely weeks away from the US border. Even before Peña Nieto’s announcement, more than 2,700 migrants from this large group had filed paperwork seeking asylum in Mexico, and hundreds had voluntarily agreed to return to their home country. But thousands more kept heading north. They set out in the early morning darkness Saturday, a routine they’d followed for days. But as they walked down a highway outside Arriaga, Mexico, they soon learned that this early morning trek wouldn’t be like the others. A wall of police in riot gear greeted them, blocking their way. For hours, representatives of the migrants negotiated with authorities. Police said they’d blocked the group to tell them about the government’s new plan. The migrants declined to sign up, and police eventually let them pass — provided that members of the group remained open to negotiating further at future stops. While this group continues its journey, other large groups of Central American migrants are following in their footsteps — including another group of about 3,000 people who reached the Guatemala-Mexico border on Sunday. The situation quickly spiraled out of control, according to CNN en Español correspondent Michelle Mendoza, who reported from the scene. Migrants threw rocks and sticks. Mexican forces threw tear gas. 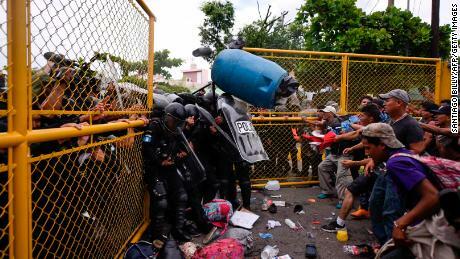 In the clashes, a 26-year-old Honduran national, Henry Adalid Díaz Reyes, ended up dead, according to the Guatemalan Attorney General’s Office. Authorities are investigating. Several other migrants and police officers sustained minor injuries. 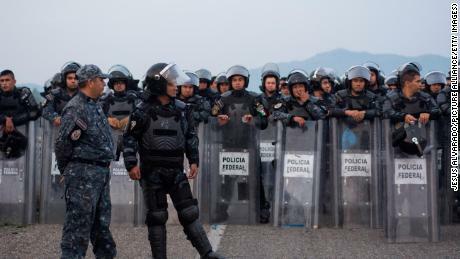 Mexican Interior Minister Alfonso Navarrete condemned the violence, stating that “aggressors” had arrived armed with Molotov cocktails. “The only way to enter Mexico is following immigration laws,” he said. On Monday, many who’d been stopped on the border bridge the day before appeared to be wading across the Suchiate River from Guatemala into Mexico. It’s unclear how authorities will treat them on the other side. Mexico historically has had a complex relationship with Central American migrants. For years, on the often-dangerous journey through Mexico, migrants from Central America have fallen prey to cartel violence and faced harsh criticism from locals. While many Mexicans have greeted the passing migrants with food and donations, a recent public opinion survey from El Universal newspaper found that not everyone is ready to roll out the welcome mat. Asked how they felt about undocumented Central American immigrants being allowed to enter Mexico and being granted refuge, 47.8% of respondents agreed, while 37.8% were against it. Others said they were undecided or didn’t have a strong feeling either way. According to the newspaper, nearly a third of those surveyed said they believed undocumented migrants should be expelled from the country immediately. CNN’s Claudia Dominguez, Jaide Garcia, Natalie Gallón and Jennifer Deaton contributed to this report. TheNewsJournal is the world’s best website designed specifically for you to search, read, review, share, save and enjoy leading international, national and regional digital newspapers online. TheNewsJournal is the leading provider of digital News online, whose titles are read by several thousand unique visitors every month. © 2018 | All Rights Reserved | Website Designed By :TheNewsJournal.